An Urthecast camera outside the International Space Station captured this view of Venezuela from space. A company plans to place two new cameras on the outside of the International Space Station in a bid to provide more live views of Earth from space. The Vancouver-based company Urthecast already has two cameras providing high-quality video from the station placed on the outside of the Russian space station segment. Urthecast now plans to install an optical and radar camera outside the United States part of the orbiting outpost. The cameras will launch on a "NASA-sponsored" cargo ship towards the end of 2016, although officials have not yet revealed which spaceship will deliver them to the station. Larson said that the cameras will include "next-generation kind of sensors." Though the specifics have not been disclosed, Larson added that the new cameras' innards will be more advanced than what's inside the Russian cameras installed by spacewalking Russian cosmonauts earlier this year. Urthecast has not yet disclosed the cost of the cameras. NanoRacks, will handle the launch, installation and integration of the cameras. The Houston-based hardware developer will work with the Center for the Advancement of Science in Space (CASIS) that manages science on the U.S. side of the station. Urthecast is a three-year-old company that launched its first two cameras to the International Space Station in November. It took two spacewalks (including the longest Russian spacewalk ever) to install the $20 million equipment as a data problem initially prevented them from transmitting imagery. Today, the medium-resolution camera is working fine. The high-resolution camera, however, is working through technical issues related to the robotic arm it is mounted on to better target Earth, Larson said. The issues are expected to be resolved after a Russian Soyuz launch this fall, although the company hasn't announced exactly when blastoff will be. "The movement of the arm is a little jerky," Larson said. "There's a small piece of hardware that needs to be launched with an internal fix that allows us to tweak how this arm is controlled. We've been testing the solution on the ground with ground-based units of the same arm." Larson added that he doesn't expect the same connection issue to crop up on the American side because the connections are different there, and the two new cameras are completely different from the older ones. Urthecast expects its revenues to ramp up as more cameras become available. So far, the company has raised $11 million from private investment and $57 million from its initial public offering on the Toronto Stock Exchange in 2013. 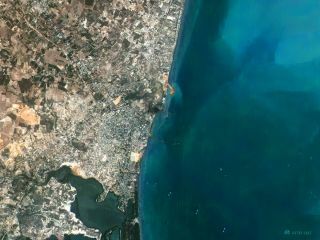 With the Russian medium-resolution camera ready, the company now has minimum commitments of $25 million a year from 16 customers, which range from the United Nations to climate change specialists to consumers interested in browsing Earth imagery. Revenues are expected to increase "significantly" after the high-resolution camera becomes available, Larson said. The customers also expect to order more imagery as the market grows. The initial letters of intent in Urthecast's business from customers totaled about $140 million annually, but Larson said it will take time to get there. "There will be things that we image that frankly, no one has ever seen before," Larson added. "Being able to take that astronaut view, so to speak, and get it out online in close to real time is going to be something special." Urthecast is one of several options to get recent views from the International Space Station. NASA's High Definition Earth Viewing (HDEV) experiment uses four HD cameras mounted outside to provide live views of Earth, when the complex is within reach of satellites. Follow Elizabeth Howell @howellspace. Follow us @Spacedotcom, Facebook and Google+. Original article on Space.com.